It’s no surprise that big banks like Wells Fargo and Bank of America encounter problems at a large scale. They suffer computer glitches that kick homeowners to the street. They get investigated by various Government agencies. They face lawsuits, fines, and settlements. All of these problems stem from questionable practices that violate ethical and legal standards. Not to mention they also threaten the entire U.S. economy. These big banks are running out of the options. But what about small “community” banks? You might think small community banks diligently serve their communities day in and day out. They make loans, create accounts, and all is humming along smoothly. You might also think because of their size, they don’t suffer risks like big banks that can affect the U.S. economy. The grey areas indicate recent major recessions. And as you can see, based on delinquency rate on credit card loans by smaller banks, two recent recessions happened near peak delinquency. This is followed by a brief period of continued delinquency, then the rate drops fast, after the recession is over. You’ll also notice from the same chart that the major recessions are timed with a ~6% peak delinquency rate. That’s about where U.S. small banks sit right now. But this is not the only disturbing indicator. 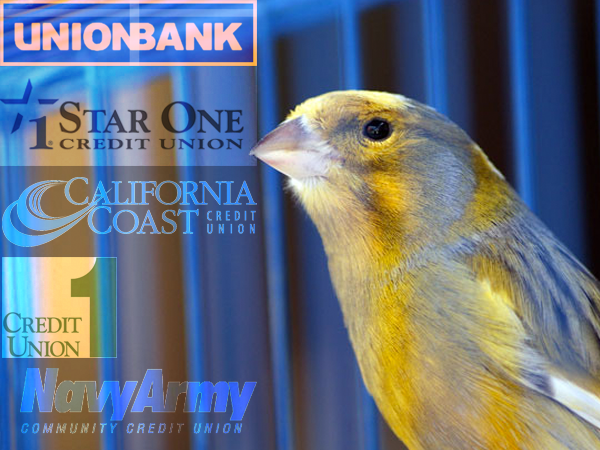 There are a couple other small bank trends that may be the economic “canary in the coal mine” signaling a recession to come. A large-scale credit crunch in 1990 happened mainly because an unprecedented number of small banks failed in a short period of time. Almost 30 years later, that fact seems to have been forgotten. Fast forward to 2018, and it looks like history may repeat itself, except with more dire consequences. One reason this may happen is stress testing. Big banks go through a series of tests from the Fed to see how resilient they are to severe financial stress. These tests are far from perfect, and the Fed has recently eased requirements, but they have revealed that big banks are likely unprepared for another recession. But smaller “community” banks aren’t even tested. This is alarming when you also discover they haven’t “raised their capital as much in relative terms as large banks and have taken on more risks,” according to MarketWatch. While the Fed’s stress tests have dissuaded large banks from expanding into commercial real estate in a big way, community banks, which don’t have stress tests, have expanded the amount of commercial real estate they’ve taken on, he said. If the next downturn impacts commercial real estate, “I do have some concerns we could see clustering of community banks failing in a way that he had in the late 1980s or 1990s,” he said. The only “tool” to combat this increased risk is to raise rates, according to Rosengren. But we already know what raising rates will do. Rosengren said this was not an “ideal place to be…but until the U.S. adopts debt-to-income, loan-to-value, other financial stability tools, you are going to be putting a lot of weight on monetary policy,” he said. So big banks are running out of options, and unchecked small banks are taking on a ton of new risk. A credit crunch similar to the 90s may be right around the corner. It looks like the economic winds are moving to hurricane force with trade wars, housing bubbles, and problems at the banks all happening at once. The debt-fueled growth the U.S. has enjoyed for the last decade is likely on borrowed time. And there’s a good bet it’s made of straw. Now is the best time to prepare, before your retirement gets blown away with the next recession. FROM JIM TREACHER, AN ACCURATE SUMMARY OF WHERE THINGS STAND.